Find what makes your heart sing and do it 110%. If it wasn’t for Ralph stomping grapes in his basement, he might never have become a vintner. I've been in the industry since 2006. I fell in love with wine at a very early age, I tasted one of the best French Grand Crus. Not only did I like the flavor of the wine I also enjoyed how sharing wine brought family and friends together. 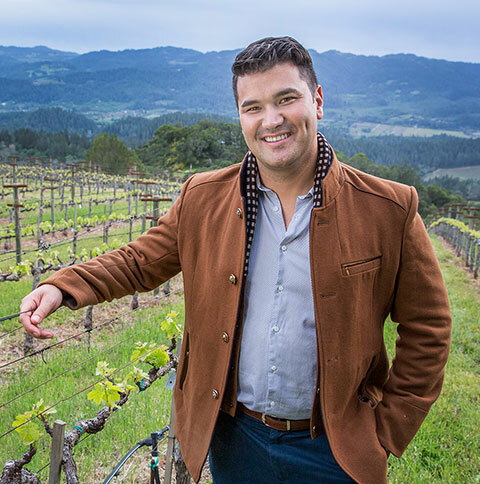 After obtaining my business degree, I became a sommelier and worked for several wineries in the Napa Valley in sales and as a winemaker's assistant. However, owning a winery would have never happened had I not made my first vintage in my basement when I was 25 (which required stomping). There are a handful of those epiphany-inspiring wines for me, but the one wine that really inspired me was Del Dotto’s 2007 Lot B2 Cabernet Sauvignon. Not only was it opulent and opaque in color, it also had the silky tannins which evolved into a beautifully long lasting finish. I knew then and there that I wanted to make that kind of wine. The most influential would certainly be Laura Barrett. In 2011, I worked under her wing as a Winemaker’s Assistant for the winery Casey Flat Ranch. As you recall, 2011 was one of the most challenging vintages in 30+ years, and I learned plenty that year. Hearing stories of how our wine has influenced people’s lives either with a food pairing, a romantic evening with their partner, a family gathering or a festivity among friends. I love how wine brings people together. Hertelendy Vineyards sources ultra premium grapes from the best terroir in the Napa Valley. Howell Mountain, Atlas Peak, Pritchard Hill and Oakville are some of the notable AVAs that we source our fruit from. Hopefully, the wines that we make with these grapes will paint a beautiful picture of what Napa Valley terroir is capable of. I’d probably be a fulltime Realtor or an actor. My grandfather Andor (who I never met), Babe Ruth, and President Obama. Pursue your passion in life. If you’re not passionate about something, definitely don’t do it. My life advice to anyone is find what makes your heart sing and do it 110%. Although I might not look or act like it (or maybe I do, who knows? ), I’m a total nerd. I speak 5 languages, classically trained in piano, and am an avid chess player.